Given the current economy and jobs climate in the U.S., this concept of a 3-month sabbatical may seem beyond idealistic for most companies. But any company that values creativity and innovation has to invest in the people who are critical to their success, and a sabbatical is a wonderful way to do it–and to market your business in the process. The 60-hour work week used to be the standard by which the term workaholic was defined. But if you were to use this today, that employee would be seen as average. The 80-90 hour work week is now the benchmark by which a true workaholic warrior is measured; where statues are erected in their name, and an adoring public marvels at their tenacity. Oh wait, I forgot; there really isn’t an award for this. As a matter of fact, most folks are too busy working to pay attention to these matters. They are simply happy to have a job that pays them a fair market wage, albeit sometimes doing the work of two people, because that is now what’s expected. When it comes to taking a vacation (if you dare), we have the requisite two weeks during the calendar year to take, on top of the week or so of holidays (don’t forget to keep up with your e-mail!). Everyone in America has become an expert in bundling time so they can actually take more than one whole full week off. Even then, we are never really on vacation thanks to the various devices that dominate our lives. How many times has a vacation started with an e-mail that reads “I know you just started your vacation, but can you….” Makes you really think about using that device as a skipping stone on the surf, mountain, lake, or wherever you take your long-deserved, but never long-enough holiday. Now I’ll go on record to say that I actually love what I do; I consider working in a creative industry a calling, and as such I don’t separate “the work” from anything else I do in my life. I make sure I fill my world with inspiration, and create a catharsis out of activities that feed my ever hungry soul. But after a while, the routine and schedule must be swapped for a state of 100 percent focus on inspiration. I’m not talking about a long weekend, I am talking about a period of time where I can completely decompress. It is that magical time that allows the soul to reflect, the body to heal, and the mind to reset and re-gain focus; I am talking about the fabled sabbatical. Certainly, the practice of a corporate sabbatical is not new; some companies in the United States and the U.K. are even instituting a “career break” policy. The criteria is usually based on a milestone of employment (five to seven years) and/or a landmark achievement warranting such a prize. The length of time varies, but I think a three month period is the perfect timeframe. Now I must stress that given the current economy and jobs climate in the U.S., this concept may seem idealistic for most companies, especially in the marketing industry. But I believe in treating employees like family, and paying it forward by offering life-changing experiences that allow for both the company to get an evolved employee, and for that person to return with a new sense of self and focus. Any company that values creativity and innovation has to invest in the people who are critical to their success. At the experiential ad agency where I work, we have a program that honors the most productive employees for great work by providing them with amazing experiences based on their own passions. 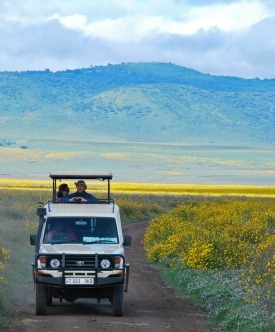 Employees can choose safaris in Africa, a trip Paris to all the museums and galleries, or a culinary adventure in Asia. Other companies have tried similar programs where they recognize and reward standout employees for distinctive service by granting them a curated “experience of a lifetime” for a period of three months. Google is one company where individuals can chose a customized sabbatical of their liking. Intel provides eligible employees with an eight-week sabbatical, with full salary and benefits, after each seven years of full-time service. And for those who want to do good with their time away, P&G launched an employee sabbatical program to support UNICEF’s work for women and children worldwide. The volunteers each spend three months working with the UNICEF teams on local projects. Whether by their choosing, or curated by the company, the employee usually has one mandate: Leave your smartphone, e-mail, any business contact with the office behind. We’ll see you when you get back. What we find upon their return is that our most treasured employees are more fearless and unified in their pursuit of magic and transcendence. They are more productive in their jobs, and that it is worth every penny.